Blondie and Brownie: Whoa! A BRUNCH Competition! New York is definitely one of the best cities for brunch; it's EVERYWHERE! Apparently, everyone is enjoying it too since whenever I go out for it 30 or 45 minute waits are the norm. So when we got an email about the next food competition, the Brooklyn Brunch Experiment, I couldn't help laughing aloud, this is going to be the ultimate brunch. 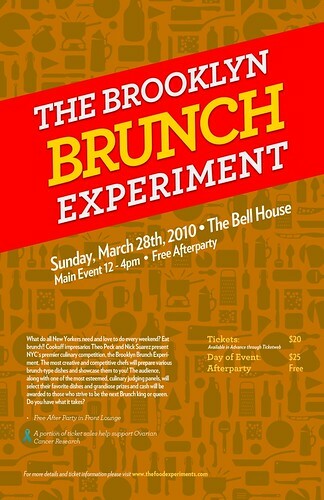 In two Sundays, the 28th, Palm Sunday for the Catholics, brunch will be served at high noon at the usual Food Experiments spot, The Bell House. Stonyfield is providing milk and yogurt, JetBlue is providing two round-trip tickets to the Grand Prize winner, and someone's getting a Cuisinart Mixer. All four competition sold out and I'm sure this one won't be any different. Get your tickets here, $20 advance, $25 at the door (if there are any). And if you think you have the best brunch dish around, go to www.thefoodexperiments.com for information on how to enter.